Wow, this is gorgeous! Love how you tweaked it...and love the colors! So delightful. I love how you create new shapes and folds. This one is so colourful. i love your idea of the santa poping up out of chimney so innovative,your cutting is always so perfect,your easel card looks so lovely,love it!!! wow sonia you have made 3 easel cards all are superb dear. Lisa Thank You I was quite pleased with this Easel card too! Cg-- Thank You and welcome back-- Sure did miss you! Suganthi Thank You .I love to experiment and innovate! Hussena Thank You so much dear you are making me feel like bowing! !Ha Ha. Asmita of all the Easels this one is my fav as I love Santa Claus!! Such lovely card. A really wonderful Christmas card. Gr8 work! Thanks so much for joining us in our easel card challenge over at BMC this time. Wow its so creative. Luv the idea too. 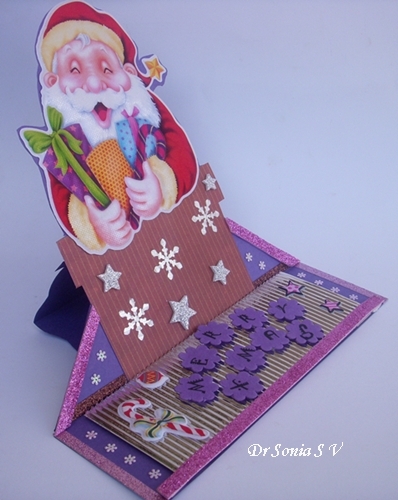 LOVELY AND ADORABLE SANTA EASEL CARD . Such a delightful card. Easel cards are so much fun. 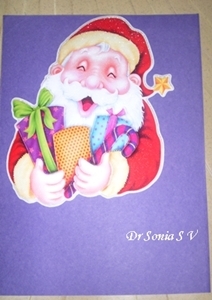 Dr. Sonia, this is too, too cute with Santa popping out of the chimney...very clever. I love easel cards. 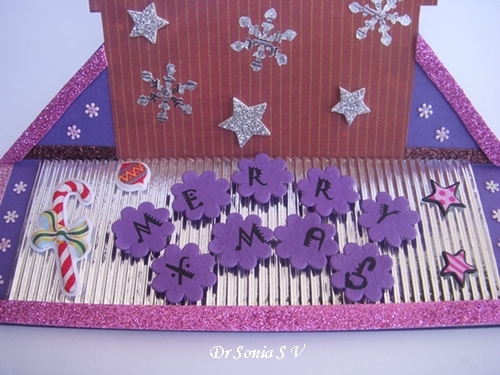 Great easel card Dr.Sonia. Very colourful. i love this easel card kick that you're on, they are fantastic pieces! Such a great idea to shape the card to the adorable santa! You did a fab creation, love the Santa. Great Job! Like Santa's face & especially like the crimped look & foil paper used. 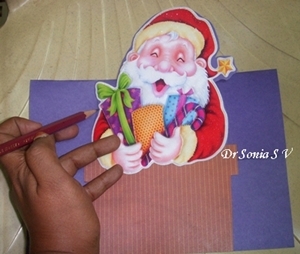 hi sonia.... nice to see santa coming in early... good use of the corrugated paper... i liked it!!! 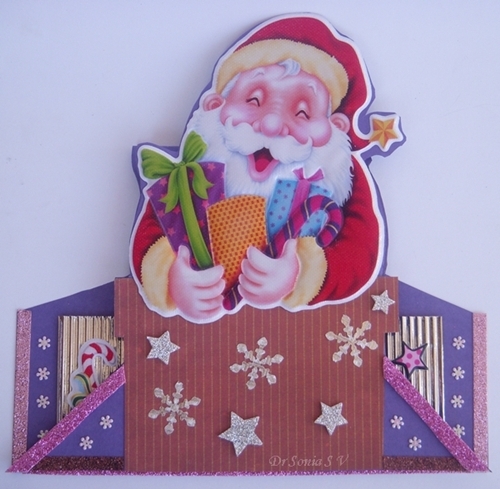 Gorgeous, bright Santa - he looks great popping out of the chimney - love how you shaped him. wow! christmas season has started early :-) very cute santa. 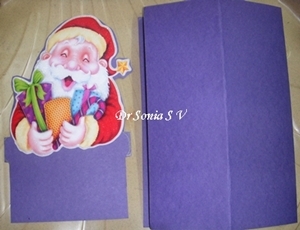 beautiful card, Sonia. 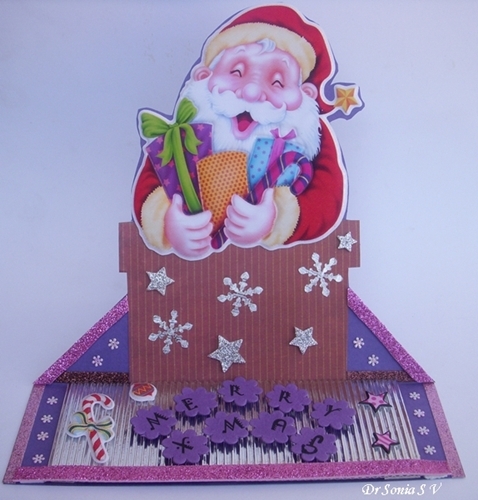 Wow, this is one fantastic easel card love the tutorial on how you made it, that image of Santa is terrific, thank you for joining us at Bearlymine Challenges. FANTASTIC! Doc you are a star! 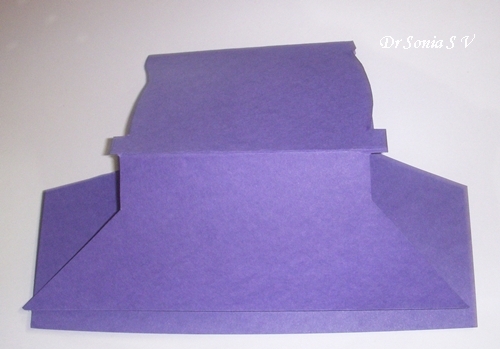 What a great shaped easel card. Thank you for playing at Aud Sentiments. What a fantastic card. I love your level of creativity. Such an inspiration. As always, thanks for sharing the tutorial! FABULOUS! Your card just makes me smile - Love how Santa is popping in/out of the chimney.I'm so glad you shared your creativity with us at Aud Sentiments during our "Winter" challenge! Good Luck!!! Wonderful card and great instructions too! Simply stunning..love that santa popping out of the chimney!! so cute!! Love how you tweak the mechanics of it!! Nice card Sonia!! love the shapes and the folds you create.Me too busy making christmas cards for my exibition!!! I love this idea. Totally going to try to cricut this in Design Studio...very cute! popped to see you from MIM. Beautiful easel card. Love the colourful santa image . Very cute card, I love your design. I saw your card on MIM, hugs Frances. What a lovely card, very beautiful! Super cute and fun card! I love easel cards! Saw this on Make It Monday! Super easel card. Thank you for sharing with us at Crafty Ann's this week. Santa in the Chimney is too cute. Do you ever choose a simple easy card to make? Love your creations. Your card atract my attention at MIM... wonderful project and tutorial!!!! This is simply outstanding Sonia!!!!!!!!!!!!!!!!!!!! This is just Absolutely Gorgeous!! Love this Santa in the chimney image, the colour scheme is fabulous. Love the easel card and the embellishments look fabulous. Thanks for joining us at Sparkles Christmas Challenge and Good Luck. Hope to see you joining us again. 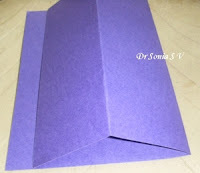 Lovely card and easy to follow tutorial! Love all the extra dimension. Hi there , Sonia . love easle cards but this one is just a little different and I am inspired to try something similar .I like the way the back part has been cut away to make the stand up bit with image really POP . This is a gorgeous card, I saw it on MIM. Love the Santa sticker you chose for your card. I saw it on Make it Monday!